Photo by Leonora Enking (CC BY-SA 2.0). Garlic Chives are native to the Himalayas as well as the Shanxi province of China and have been cultivated in China and Japan for centuries. This is a heritage, open-pollinated variety of Garlic Chives meaning you can collect the seeds year after year and they'll grow the same as the parent plant. Garlic Chive leaves have a mild, delicate flavour of garlic and onions. They can be used in many dishes including salads, soups, stews, stir-fries and other Asian dishes such as kim-chi, vegetable pancakes and dumplings. Slice Garlic Chives thin to get the most flavour from each leaf. Don't over-cook Garlic Chives as too much heat will destroy their flavour and can cause them to become fibrous, if possible add them for only the last minute of cooking. Choose a growing site for Garlic Chives that receives full sun or light shade. Ensure your soil is free draining, grow Garlic Chives in raised beds if your soil is too compacted or heavy in clay. Dig through lots of organic fertiliser, compost, well-rotted manures and/or worm castings prior to sowing. Fertilise monthly with an organic liquid-based fertiliser, worm juice or pelleted organic fertiliser. Mulch around Garlic Chive plants well to retain moisture, keep their root systems cool and suppress weeds. 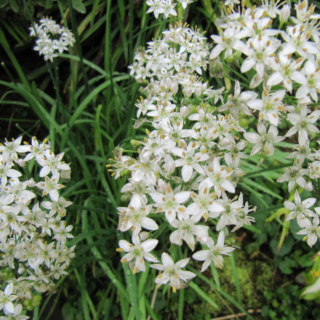 If Garlic Chive plants are left to set seed they'll loose vigour, so pinch off the flower heads before they fully form to prolong the life of your plants. The scent of Garlic Chives is a natural aphid repellent when planted next to other plants that suffer from them. In tropical areas of Australia sow Garlic Chive seeds from April to July. In subtropical areas of Australia sow Garlic Chive seeds any time of the year. In temperate areas of Australia sow Garlic Chive seeds from September to May. In cooler areas of Australia sow Garlic Chive seeds from September to April. Sow Garlic Chive seeds 1cm deep, spacing or thinning plants to 15cm apart to allow room for the clumps to form. Garlic Chive seeds take between 12 and 20 days to germinate once sown. Garlic Chives take between 12 and 14 weeks to produce good quantities of leaves. Your clumps of Garlic Chives will re-shoot best if cut about 6mm above soil level using scissors to ensure a clean cut.